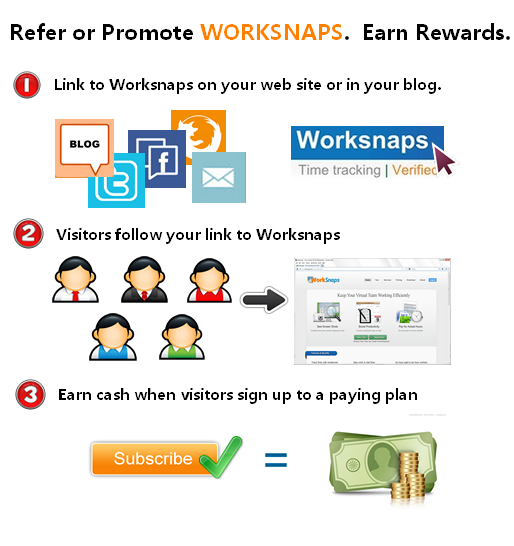 How you can earn money by promoting Worksnaps. Earn cash for referring Worksnaps When people you refer to Worksnaps subscribe to a paid plan, we give you 25% of the subscription price every month during the 1st year and 15% thereafter, as long as the customer is paying. You can get the payout via PayPal. See Worksnaps pricing for more details on our plans. We provide an Affiliate Console in which you can see real-time information about your referrals, sign-ups and balances. We have an affiliate program manager to help you get started quickly and solve any question you have. We provide the graphics and texts that you can use to start promoting Worksnaps. Payments are made on referral income earned after the referral period is complete. For example, if you refer a monthly subscription of $30, you will earn $7.50 (i.e., 25%) after approximately 30 days (i.e. the length of that month). You will continue to earn $7.50 per month for one year, or until this user cancels or changes his paid subscription - whichever comes first. After the first year, you will earn $4.50 (i.e., 15%) per month until this user cancels or changes his paid subscription - whichever comes first. Should the referred user upgrade or downgrade the service, the new payout will be calculated based on the new payment made by the user. The one year peoriod that the referral receives 25% of the sales will not change due to the upgrade or downgrade. Should the referred user cancels service, your referral payment will be terminated as well. However, you will still receive the commission on the user's last payment for the partial month. Should the referred user apply a discount code when subscribing to the service, referrals will be paid based on the discounted rate. With each link, email or marketing advertisements that you display on Worksnaps.net' behalf, you expressly agree to abide by the Affiliate Program Terms of Service which are in full force and effect at that date and time. Affiliate offers apply to new customers only.